Home Home FREE BOOZE AS CAPETONIANS LOOT BEER TRUCK! 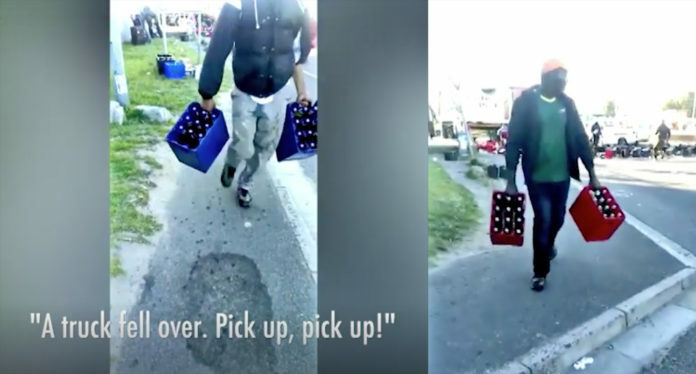 FREE BOOZE AS CAPETONIANS LOOT BEER TRUCK! The road was flooded with beer as bottles broke when the truck lost its load. Booze-loving Capetonians thought Christmas came early this year when an SA Breweries truck lost its load in Wetton suburb‚ southeast of the city centre‚ on Wednesday morning. Nearby residents rapidly began stripping the truck of its cargo‚ running off with crates of beer and calling bystanders to do the same. On-scene officers reported minimal traffic disruption. Next articleSOMEONE JUST WALKED INTO A BOKSBURG KFC, ORDERED AN ICE-CREAM AND DID THE UNTHINKABLE!